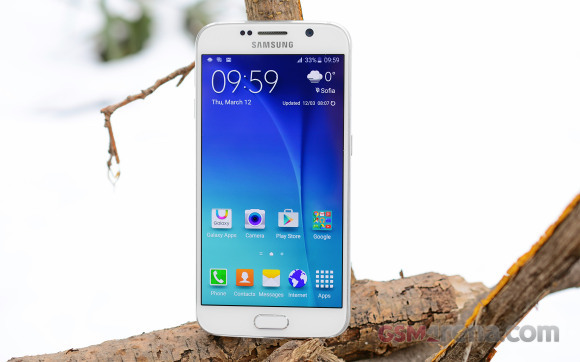 The display of the Samsung Galaxy S6 is the highlight feature alongside the new design and chipset. The diagonal remains unchanged at 5.1", but the resolution got a massive boost to QHD - 2560 x 1440 pixels. 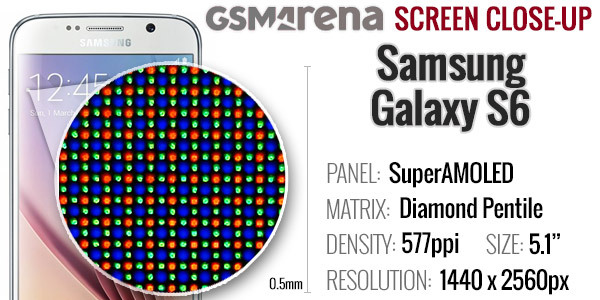 This means that despite its ample surface, the Super AMOLED panel offers a mind-blowing 577ppi. Samsung has again went for the diamond-shaped PenTile matrix, although given the sheer number of pixels the sub-pixel arrangement will hardly affect the perceivable sharpness of the screen. Here's how the layout looks under a microscope. The diamond-shaped PenTile uses OLED sub-pixels of different sizes as each color has different levels of power efficiency and longevity. Sub-pixel rendering is employed to properly distribute each of the primary colors. The default screen mode comes to underline the Super AMOLED panel's key strength, high contrast, by producing overly saturated colors that make every image look like it's about to pop out of the frame. Yet if you are a professional that requires the color accuracy or simply dislike the unrealistic images, the professional photo mode gets colors as true to life as possible. The Samsung AMOLED panels have been improving with each new generation and this latest effort is further proof of that. Giving you a choice between saturation and accuracy, and comfortably beating its rivals at either end is an impressive achievement, but with the inherent AMOLED strengths in the equation, you get arguably the most impressive screen in the market. Yep, the practically infinite native contrast and the low reflectivity that makes sure you enjoy most of it in brighter environments are still here, alongside the impeccable viewing angles. There isn't much else one can wish for. But enough words, let's look at the numbers. The Samsung Galaxy S6 has a practically unlimited contrast ratio, as it's capable of displaying black by simply turning off individual pixels - AMOLEDs light up only the parts of the screen that display a color different than black. The Super AMOLED panel on the Galaxy S6 isn't particularly bright, especially compared to some LCDs, but it can go higher than the Galaxy Note 4. Update, March 16: As it turns out the Auto Brightness mode can push the brightness higher than manually adjusting the brightness slider would allow you to. It's not something limited to the Galaxy S6 but it's customary for Galaxy smartphones with AMOLED screens. We confirmed that under bright light the Galaxy S6 display can light up to 70% brighter than the maximum allowed by the slider. Under direct sunlight, the Galaxy S6 retains excellent contrast and stays legible even in the most brightly lit environments. The battery life was a bit of a question mark hanging over the Samsung Galaxy S6, considering the screen resolution has nearly doubled and the battery capacity was downgraded to 2,550 mAh. It still sounds like a pretty ample battery, but we were curious how it compares to the stellar Lollipop endurance of its predecessor. As it turns out, we were right to be worried as the Galaxy S6 posted lesser performance on all of our test compared to the Galaxy S5. The battery scores aren't that bad and are in fact higher than average. The S6's battery had enough juice to last just under 20 hours on 3G calls. That's less than the Galaxy S5 managed, however the new model beats it at both web browsing and video playback. 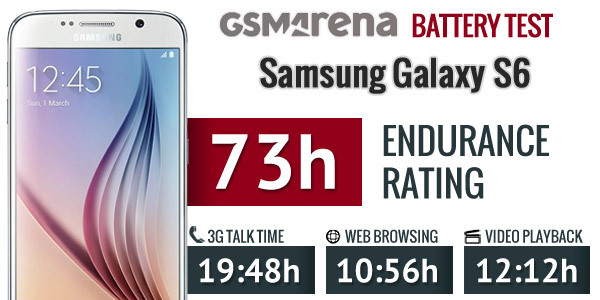 In the end the new flagship managed to achieve of respectable rating of 73h, which might not be as impressive as the 83h mark of Galaxy S5, but it still means your Galaxy S6 will last three days if you are using it for an hour of calls, web and video playback each day. Our testing procedure includes a standby battery endurance test, which is not shown in the scorecard above, but is a part of the overall rating. You can learn more about our standardized routine here. Update, April 3: We received a retail unit and re-ran the benchmark. The numbers improved noticeably compared to the initial tests with the pre-production unit. The Samsung Galaxy S6 is armed to the teeth in connectivity terms. The mandatory 2G/3G/4G LTE is present with Cat. 6 downlinks thanks to Samsung's latest Exynos 7420 chipset. This gives you download speeds of up to 300Mbps, with 50Mbps worth of uploads. If you missed it in the specs section, the Galaxy S6 uses nano-SIM cards. In terms of local connectivity, there's dual-band Wi-Fi a/b/g/n/ac, so you can make the best of your home's Internet connection. DLNA is supported in multimedia apps for sharing content across compatible devices. Speaking of, the Galaxy S6 makes it easy to share the Wi-Fi hotspot info with nearby devices (detected via Bluetooth) using the Quick Connect feature. This saves you the trouble of typing in the Wi-Fi password. Bluetooth has been bumped up to version 4.1. There aren't any easily noticeable changes since 4.0 but, among the more important ones, Low Energy mode is now supported for connecting to smart watches and some sport sensors. ANT+ is available for such sensors too, so the Galaxy S6 will happily talk to whatever sports sensor you have. NFC is on board for quick pairing and sharing and there's an IR blaster for controlling home appliances. Samsung's default app mostly handles your AV setup, but third party apps can be used for a wider range of devices. The Samsung Galaxy S6 features a microUSB 2.0 port. It's slower at transferring data than the USB 3.0 port used in a few Samsung devices, but it has a standard size plug and it offers Quick Charge 2.0 and MHL 3.0. With the right adapter, you get 2160p@30fps output so you can watch videos you shot with the phone in their full resolution. There's 7.1 surround sound output, if the video player supports it (sadly, the pre-installed one does not). Finally, there's a GPS/GLONASS/Beidou SatNav receiver on board. GPS alone is enough on its own but GLONASS provides extra precision, especially in dense urban settings as it also uses Russian satellites. Beidou is currently available only in China and neighboring regions, but China is an important market for Samsung so it's a nice thing to have on board. Samsung Pay is available by default on the Galaxy S6. The new service works with NFC and a newly developed technology called MST - Magnetic Secure Transmission. The MST will allow the Galaxy S6 owners to use their phones on most of the existing terminals and merchants won't need to upgrade their payment solution. Samsung has acknowledged the mobile wallet adoption is going very slowly and the company has built-in a new solution to this problem inside the Galaxy S6 with the MST tech that requires little to no upgrade from current card readers already installed at retailers. Samsung Pay has already been certified by Visa and MasterCard. Samsung is teaming up with key financial institutions around the world such as American Express, Bank of America, Citi, JPMorgan Chase, and U.S. Bank, in order to provide more flexible services and coverage. Samsung Pay is KNOX-secured, which means the Galaxy S6 users should be getting government-grade protection of their personal data.